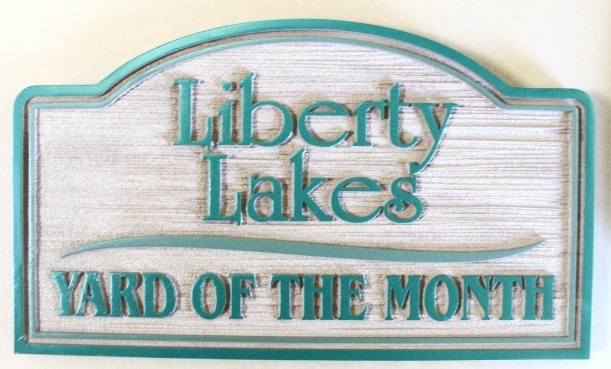 Above is a natural-looking YOM sign for the "Liberty Lakes" HOA which has been lightly sandblasted to give the surface a woodgrain look. In this sign, the text and borders are carved in 2.5-D (raised, flat relief). After hand-painting with bright, long-lasting automotive-type enamels, this plaque is clear-coated, dried and clear-coated again for waterproofing and UV protection. This sign can be purchased with a steel stake that can be easily inserted (it has a foot pedal) and removed in the ground for easy movement from one yard to another. This all-weather HDU sign is light weight, long-lasting, maintenance free, and easy to move every month. We customize these signs with any shape, border, font style, color scheme, carved (engraved or raised) text and art of the customer's choice. Artwork and/or logo (2.5-D raised, carved or engraved) are included at no additional cost . Non-custom 3-D artwork is available at minimum cost (with cost depending on size). To see many photos and designs of over 30 other Yard-of-the-Month and Home-of-Month signs in Gallery 19B, click on "Return to List>>" below right. We make custom & personalized elliptical, decorative, and other shape long-lasting and beautiful wooden and HDU Yard-of-the-Month or Home-of-the-Month signs complete with wrought iron stakes that can be easily moved from one property to another. We can make a 2.5-D (or 3-D) custom carved wood or HDU wall plaque of any design in any size from 18 inches to 36 inches, for all-weather outdoor use. You may also choose from a wide election of shapes, borders, font styles, text and artwork. To see photos of other HOA, condo, subdivision and apartment entrance, office, directional, unit number and rule signs. click on Gallery 19 (large entrance signs) or Gallery 19A (smaller miscellaneous signs) in the numbered gray boxes on the lower left margin. Other related residence signs are Galleries 17 (street and traffic signs), 18 (individual house address/welcome signs), 20 (seashore home signs) and 21 (lake & mountain home signs). We have over 8000 photos of signs and plaques on the website, organized into 45 photo galleries listed on the left; click on the numbered title in a gray box to visit another gallery. To return to the Yard-of-the-Month signs,, Gallery 19B, please click on "Return to List" below right.